3D Topicscape Personal Edition Lite uses the concept-mapping or mindmapping approach to allow ideas and information to be organized, but in place of the usual 2D sheet, it works in 3D. This sparks creativity and innovation by providing a tool to capture ideas - as they flow - in an unlimited 3D mindmapping landscape. If you think visually, you now have a new way to manage your To Do lists and organize information, computer files, and web pages. ...... But a major challenge for business users of mindmaps or concept mapping comes when the practical limits of a flat sheet are reached. This happens on any substantial project, yet that is the time when you most need the ability to scan the information landscape. 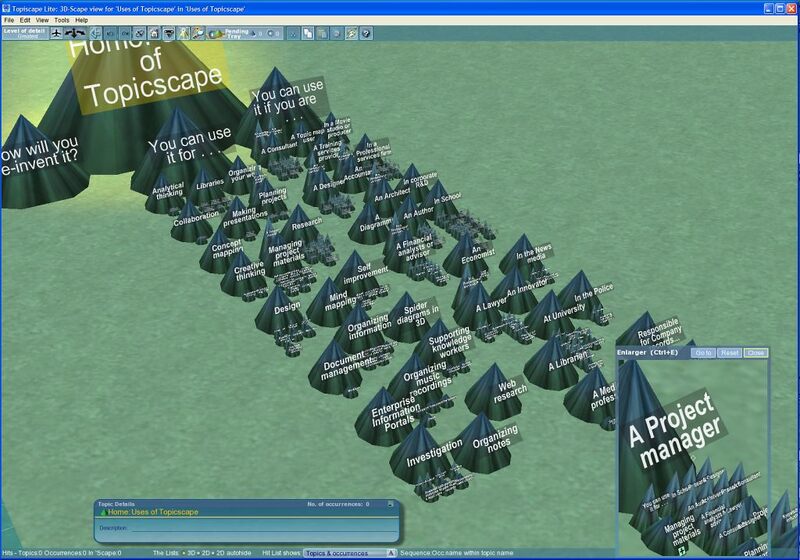 3D Topicscape overcomes this by allowing effectively unlimited levels of hierarchy. 3D Topicscape Lite provides zooming, and flight through the information landscape. Qweas is providing links to 3D Topicscape Lite 1.20 as a courtesy, and makes no representations regarding 3D Topicscape Lite or any other applications or any information related thereto. Any questions, complaints or claims regarding this application 3D Topicscape Lite 1.20 must be directed to the appropriate software vendor. You may click the publisher link of 3D Topicscape Lite on the top of this page to get more details about the vendor.